A couple of years ago, I stumbled across a recipe for making your own gin at home, safely and legally. No bathtubs are involved. You see, at heart, gin is really just a neutral grain alcohol that has been infused with juniper berries and other botanical ingredients. It’s been said that gin is the original flavored vodka, although it was once something more like flavored moonshine. Genever, still made today by the Dutch company Bols, is maltier, sweeter, and earthier than the dry gins most of us are more familiar with today. English distilleries in the nineteenth century created a more filtered gin, still slightly sweet, called Old Tom. In the twentieth century, a drier and even more heavily filtered version of gin gained popularity, London Dry, which was the only gin most Americans knew about for decades. More recently, older styles of gin have become popular again, and some companies are making a wide variety of gins. The only common factor is the trusty old juniper berry. If you think you don’t like gin, you probably just haven’t had the right one yet. Most commercial gins include the juniper and other botanicals before distilling, which is why the result is a clear liquor. However, without access to a still, you can simply infuse the botanicals directly into already distilled liquor. Because the berries and other stuff goes straight into the liquid, it will end up with some color to it, but don’t let that scare you. There are a lot of recipes online for homemade gin. I started with something similar to the one I found here and gradually experimented with some other recipes. For all of these recipes, I leave the botanicals in the alcohol for 3 days and then filter out the solids using cheese cloth. The first gin we made here at the Whiskey Thief is something we now simply call Gin #1. It uses a lot of spices that you might associate with Indian food–cardamom, coriander, cinnamon, etc. It tastes like Christmas morning. 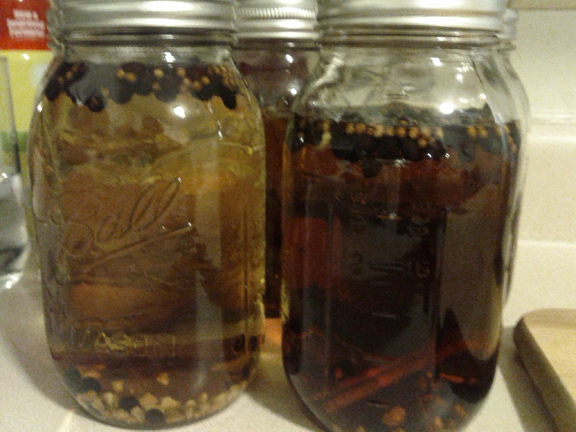 I have also used whiskey as a base for Gin #1, instead of vodka. It makes for an interesting spiced whiskey, but I don’t think it’s really gin unless you start with something more neutral. Jen likes Gin #1, but I find the coriander overly intense. When I revised the recipe, I cut way back on the coriander and added some clove. I also switched from vodka to a white (unaged) whiskey, aka moonshine, hoping to achieve a sweeter Old Tom-like gin. Having compared the result to some Old Tom gins purchased in another state, I think ours is a contender. After that, I decided to see what it would be like to concentrate just on juniper without any other flavor components. Juniper actually has a really complex and interesting flavor on its own, with subtle notes of cinnamon and vanilla that can easily get covered up by citrus peel and other spices. The most recent and possibly most ambitious experiment has been to try and make a cucumber gin. Commercially, the only thing on the market like this is Hendrick’s, and it’s rather expensive. For my first attempt, I used too much cucumber, and I neglected to peel them first. The peel of the cucumber left the gin tasting bitter. With some trial and error, I came up with a recipe that we think has a similar flavor profile to Hendrick’s, but it’s much stronger. We had to cut it with more vodka to achieve the desired result. As a bonus, we had gin-flavored pickles at the end. They still needed to be sweetened, but putting them in a mason jar with some sugar for a couple of days did the trick. This entry was posted in gin, history, recipes and tagged genever, gin, history, old tom.